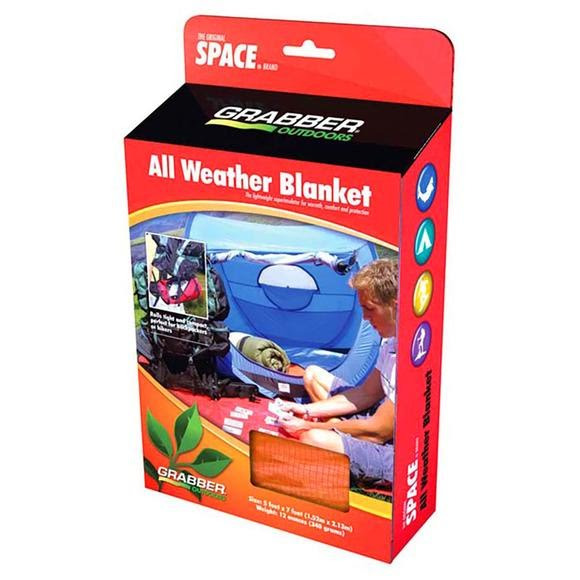 Utilizing a four-layer construction of super insulating materials, Grabber Intl's All Weather Blanket reflects and retains over 80% of radiated body heat. It is reusable with full edge binding and grommeted corners. If dirty, simply rinse off and wipe dry. Available in four colors. This is an ideal accessory for all those venturing in the outdoors. Utilizing a four-layer construction of super insulating materials, Grabber Intl &apos;s All Weather Blanket reflects and retains over 80% of radiated body heat. It is reusable with full edge binding and grommeted corners. If dirty, simply rinse off and wipe dry. Available in four colors. This is an ideal accessory for all those venturing in the outdoors.